The Space Shuttle Program (SSP) have concluded their manifest meeting by realigning the 2009 shuttle schedule. The preliminary schedule changes – which calls for five shuttle missions – were called for after the delay to STS-125’s mission to Hubble. As a result of the meeting, Ares I-X is likely to be delayed until October, 09. Atlantis will be heading back to her OPF (Orbiter Processing Facility) after de-stack operations next Monday, with the ET-127/SRB stack now waiting on Discovery for February’s STS-119. Discovery and the STS-119 stack will also support next week’s STS-126 mission as the LON (Launch On Need) vehicle. “The Atlantis (OV-104) stack will be demated, and the Orbiter will be rolled back to the Orbiter Processing Facility (OPF). The Discovery (OV-103) Orbiter will be mated to the ET/SRB stack which was going to be used for STS-125,” notes from the manifest meeting opened. 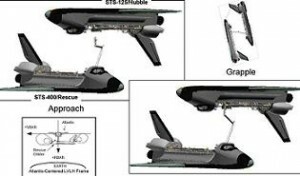 Pending the on time delivery of the replacement hardware for the Hubble Space Telescope, STS-125 will then launch in May, ably supported by Endeavour as the LON vehicle – as was previously the plan for the original launch target last month. This time, Endeavour will revert to STS-127, for launch in June, 09. “As a result, STS-125 (HST SM4) will not fly before May 2009. The rest of the SSP manifest is being reworked accordingly. Should STS-125 suffer from another delay, STS-127 will take STS-125’s May slot, allowing for the final assembly mission of the Kibo Laboratory complex, by carrying the Japanese Experiment Module – Exposed Facility (JEM-EF) to the ISS. Prior to the slip of STS-125, STS-127 was due to launch on May 15, 09. A decision will be made in late March on the status of STS-125’s launch date, which will be based on the confidence the replacement HST hardware will arrive at KSC in time to support STS-125’s May target. The manifest meeting then realigned the downstream missions. Moving to the right slightly, and changing orbiters, is STS-128/17A, which is now set to launch in August on Discovery (OV-103). 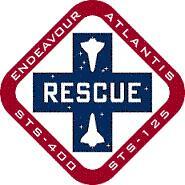 Originally, STS-128 was due to launch on Atlantis at the end of July. The mission was recently baselined as a 11 day, two EVA flight to the ISS, the first flight of the OI-34 Flight Software, and the last scheduled ISS crew rotation to be undertaken by the Space Shuttle Program (SSP). The primary payload will be the Multi-Purpose Logistics Module (MPLM) Leonardo and the Lightweight Multi-Purpose Experiment Support Structure Carrier (LMC). 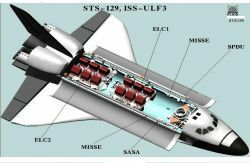 It is not known if the mission will be extended in duration, via Discovery’s SSPTS (Station-Shuttle Power Transfer System) capability – which Atlantis lacks. Rounding out the year is STS-129/ULF3, which will launch in November, moving from its previous slot of October 15. This mission was previously allocated to Discovery, but is now likely to move to Atlantis – following the reassignment of STS-128. STS-129 will deliver the first two of five Express Logistics Carriers (ELCs) to the ISS, and is currently due to return Canadian Space Agency astronaut – and ISS Expedition 20 Flight Engineer-4 – Robert Thirsk to Earth. Specific details, including the new NET (No Earlier Than) dates will be allocated on the next FAWG (Flight Assignment Working Group) manifest, which will also clarify the status of the next four missions – which weren’t covered by the manifest meeting. FAWG manifests are always preliminary schedules, with NASA working the schedule one mission at a time. They provide all relevant departments with processing targets for the orbiters and other items, such as the External Tanks. STS-130 – currently assigned to Endeavour – is now likely to be the opening mission of 2010, which will result in the delivery of Node 3 to the ISS. The payload is due to arrive at KSC’s Shuttle Landing Facility (SLF) on February 13, 2009 – according to notes this week. It is now likely that these missions would be moved deep into the summer of 2010, before taking into account any natural slip (weather, technical issues) in flights over the coming 18 or so months. It is not beyond reason to expect a full 2010 schedule of shuttle missions, even before any extension possibilities are factored into the equation. Back to 2009, and one major consideration that managers have been discussing is the allocation of the Ares I-X test flight’s launch date target. This launch requires Pad 39B to be modified – among other items – which the latest delay to STS-125 has hindered. Currently, STS-125 requires the LON vehicle to be ready to launch within days of an emergency being called. To achieve this, the LON vehicle is placed on Pad 39B, while STS-125 launched from Pad 39A. Only until the STS-400 LON vehicle vacates 39B can engineers begin major modifications to the pad for Ares I-X. This was discussed at the manifest meeting, which included the possibility of a plan that was previously dismissed, the P-t-P (Pad to Pad) Single Pad plan – presentation on L2 – where a major effort would be undertaken on Pad 39A after STS-125 launches, to allow the STS-400 LON vehicle to take up residency on a vastly reduced timeline, should a rescue be required. If the Single Pad “P-t-P” plan continue to be dismissed as unviable, Ares I-X looks likely to be moved until the end of the year, based on a May STS-125 launch target. Another slip to STS-125 would move Ares I-X into 2010. Interestingly, studies are being evaluated that involves the cancellation of the temporary lightning protection tower that is set to be built on to the top of 39B’s FSS (Fixed Service Structure), given the delay to Ares I-X would mean the Ares I lightning towers – currently being built – would provide the required protection for Ares I-X. Ironically, the manifest meeting came on the same day as the Constellation Program (CxP) had their first face to face meeting on the potential to accelerate their schedule, in order to buffer the impact of the recent slips to their Ares I flights. The delays to Ares I-X would not be major impact on Ares I/Orion’s opening launches to the ISS, with second test flight – Ares I-Y – not due to launch until around 2013. However, it would delay the gathering of vital data for CxP, which in turn may hold some level of impacts for the development of Ares I. Notes from the CxP Acceleration meetings – available on L2 – will be used in a future article.